Celebrate National Dental Hygiene Month With BRAIDC! October is National Dental Hygiene Month! This is an effort to celebrate all the work that dental hygienists do and to help raise awareness on the importance of good oral health. Your oral health is a very important part of your health overall, so it’s important to practice good habits year-round. Be sure to brush every day, floss regularly, and schedule your regular checkups and cleanings! The team at BRAIDC is always dedicated to keeping your smile healthy and happy. If you have had implant dentistry done, or you have it scheduled in your future, here’s a few things you should know ! How Do I Take Care of my Dental Implant? If may be a foreign material, but it’s still attached to your living body and needs to be taken care of appropriately. Just like your teeth and gums, it will need to be cleaned and cared for properly. Be sure to carry on your normal dental hygiene routing, such as brushing and flossing it’s important to keep the gums surrounding the implant in the best shape possible. It’s possible that a deeper flossing technique needs to be used on dental implants. The roots of natural teeth are fat, so when the floss slides down the side of the tooth, the floss will naturally hit the bottom of the pocket. Implant crowns are fatter than the skinny dental implants they sit on. When you floss dental implants, be sure to slide all the way under the crown (horizontally) and touch the implant root. This will clean the space between the crown and the gums that in not necessarily the gum pocket. But lots of food and bacteria can get trapped there. What Happens When Implants Aren’t Properly Taken Care Of? When you don’t take proper care of your implants, it’s possible for the rest of your mouth can suffer. You’re the only one who can keep track of your dental health, so it’s important for you to practice proper care. The earliest sign of an issue is bleeding of the gums. This paired with lack of proper care can lead to periodontal disease. Over time, it can result in bone loss around the implant, which can affect the structure of your jaw. If dental implants aren’t properly cared for, they will suffer along with the dental restorations they support. This can lead to implant failure, as well as peri-implantitis, a highly problematic inflammatory disease that destructs both the soft and hard tissues around the implants. 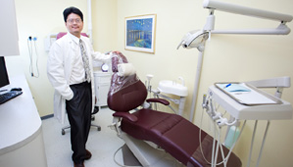 As with all dental restorations the better you take care of it the longer it will last. Here at Beverly Restorative and Implant Dentistry, dental implants are one of our specialties! From your initial visit, through the procedure, and continued care afterwards, we’re with you every step of the way. Celebrate National Dental Hygiene Month by scheduling your appointment today!